As WordPress has grown in popularity, the need for a more user friendly approach to web design has been on the rise as well. As time has gone on, technology and great minds have managed to come together to produce the infamous drag and drop interface. Now that there are multiple ones on the market, Charlie (new owner here at 87 Studios) and I thought that it might be cool to have a sort of drag and drop shootout. Yee-ha! Ever since the arrival of Divi by Elegant Themes, I have been noticing a lot more interest in drag-and-drop themes and plugins. But the question remains the same: Which one is the best? For this post I'll be looking at three of the most popular drag and drop interfaces, their features, and some pros and cons to each one. From there, my hope is that you'll have a rounded idea of each one to help you make your choice a little easier. Many take the phrase "drag and drop" to automatically translate into "easy". Though it's true that Divi does make it somewhat easier for coders and non-coders to build a beautiful and responsive website, the term "easy" may be a bit of an overstatement. The page builder does eventually become easy to use, but that's only after you've spent time learning it. When first starting out with Divi, you should expect it to take a few hours and perhaps a whole day before you really get the hang of it. Designing with it will still be time consuming and will require some visual testing before you get things right where you want them to be. I use Divi, and I love it, but even for a web designer like myself, it took some time to really get a handle on the power and options. Perfect For Non-Coders. Divi is a great theme for people who want to build a site without code, or for web designers looking for a way to speed up their designs. Endless Possibilities. The selection of Section layouts and Module options means that you can create, or recreate, just about any look you like. 19 Pre-Designs Layouts And Growing. If you don't want to design from scratch, no worries! The pre-designed layouts will help you get started on the right foot. An Evolving Product. Since Divi comes from the ever amazing Elegant Themes WordPress Theme Shop, it will continue to evolve into a better product. Learning Curve, and Still Time Consuming. Though Divi does have a learning curve, it gets easier to use the longer you explore and test your designs. However, you should realize that building a pixel perfect site will still be time consuming (and may take a bit of coding too). Price. Starting price for Divi theme is $69 (not bad initially) but that price is charged annually. The only upside to that is the fact that you get ALL the themes at Elegant Themes for that price. So technically speaking, Divi is only 0.79¢... Maybe that's not so bad after all. Page Builder Is Only Available With Divi Theme. Divi is a drag and drop theme, and the page builder in the theme is available solely in Divi. The Builder Only Works In The Back-End. As of now, there is no front-end editing with Divi. If that ever became an option, then this theme would blow all others out of the water. At the end of the day Divi is a great and flexible drag and drag theme, but like any drag and drop interface it will take time to learn it in order to really get the true power out of it. 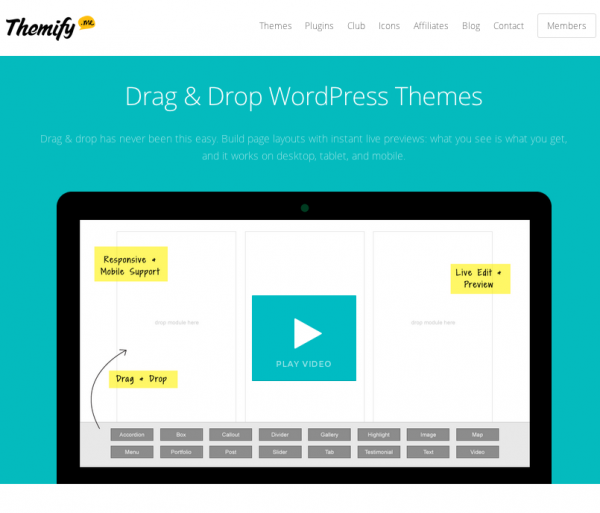 Themify is a WordPress theme shop that focuses on drag and drop style themes. 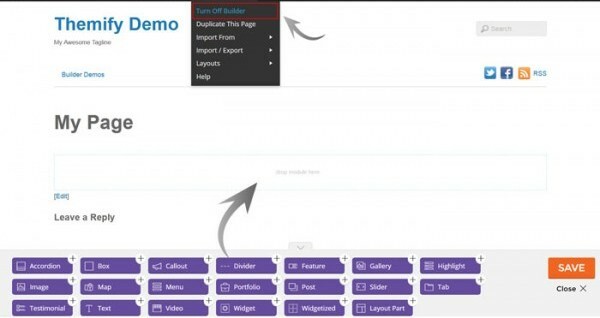 Not only do they offer a wide selection of themes that are powered by their drag and drop theme builder, but they also sell their Builder Plugin separately. The Builder Plugin has quite a few features (i.e. 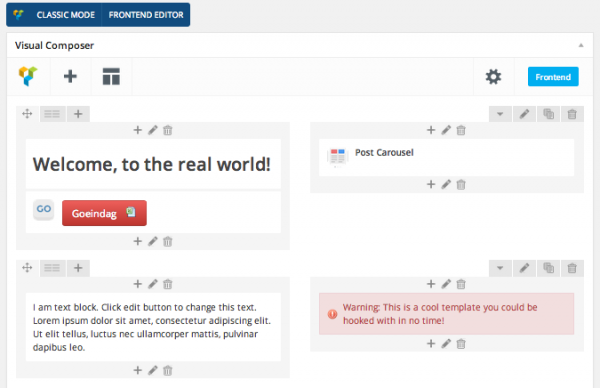 it's responsive, and SEO optimized), but one stands above all the rest: The front-end editor. The Themify Builder Plugin allows you to visually build your website's pages on the front-end. Unlike the Divi theme that requires you to build pages in the back-end and then preview the final result, the Themify Builder allows you to use the drag and drop interface on the actual page (!) that you want to design. This is a huge time saver! As with nearly all WordPress themes on the market today, you generally have to make your tweaks to design in the back-end, and then you have to preview the end result in real time. This generally leads to more tweaking and more previewing which translates into more time. 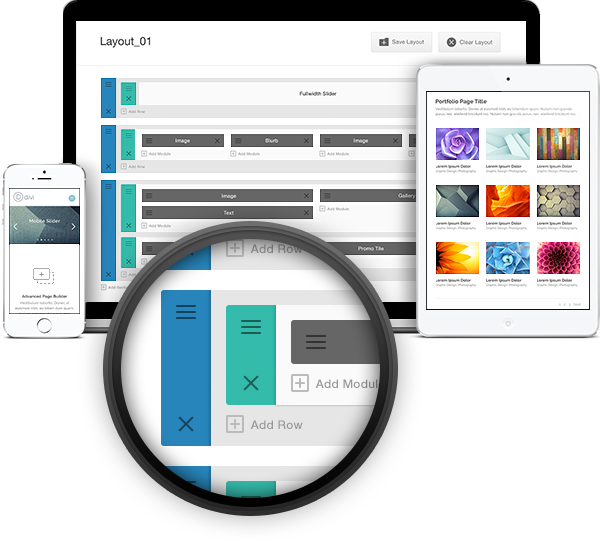 The Themify Builder Plugin and themes help alleviate this designing headache. The idea behind the Builder drag and drop interface is similar to Divi, only with less of a learning curve. You add Columns to your page, and then you drop in the Modules that you'd like to use within any given column. The other upside to the plugin is that you can use it on other themes outside of what is available in the Themify shop. Therefore, you can build different layouts on pages no matter what theme you're using. (Nice!) There are some drawbacks though... The Themify Builder is easier to learn then Divi because there are fewer features to utilize. Whereas Divi lets you easily create a visual separation on the page (like adding a different background color or image to the sections you create), you don't have that type of functionality with this product. Easy To Learn. The interface is pretty intuitive so you won't need to spend much time learning how to work it. Reasonably Priced. The price for the plugin alone is $49, however, also have the option of buying 2 themes for the same price; the builder plugin is built in to each theme. Works On Most Current WordPress Themes. The plugin turns your non drag and drop theme, into a full fledged D'n'D interface. Woo-hoo! Nice Choice Of Layouts & Modules. The Themify Builder comes loaded with 8 pre-designed layouts, and 16 modules to choose from . Front-End Editor. Need I say more? Still Has A Slight Learning Curve. This really isn't that big of a drawback. Every drag and drop theme or plugin has this learning hump, so don't let that deter your choice. If you're looking for something that simply lets you build a page with a varying layout to sort of shake things up, then the Builder Plugin by Themify is a great option. However, if you need to build dynamic pages with things like fly-in animations, then this really isn't what you're looking for. The way that Visual Composer works reflects that of the other two I've talked about so far: Create columns, add modules (or Elements, as they are referred to by Visual Composer), insert your content. Visual Composer comes with over 40 different Elements that you can use to build your pages with. It even supports 3rd party plugins like Contact Form 7 (free plugin) and Revolution Slider (another popular plugin on CodeCanyon). Another nice feature is the ability to edit the background of your individual columns. In this regard, Visual Composer beats out Divi because you have to use CSS to change the background on a specific column within one of the sections. VC does take time to learn. It's easier to learn then Divi, but since it has more functions, it will take more time to learn then the Themify Page Builder. My suggestion would be to read up a bit on all that Visual Composer has to offer and to give it a test run before you buy it. Price Is Awesome! The price for the VC plugin is only $28. With all the functions available in this plugin, that's a pretty great deal! Front-End Editor. Design and tweak in real time. No back-end editing needed, unless you prefer it; it comes with that option too. User Friendly. Visual Composer has a style similar to the Themify Builder which makes it easier to learn. Add-Ons. The add-ons available means that you can extend the functionality above and beyond that of what even Divi offers. The Add-Ons Get Pricey and Increase The Learning Curve. The amount of time to learn how to use VC may be increased if you decide to purchase one or more of the 50+ (yes, they have over 50!) Visual Composer Add-Ons. The add-ons do extend and increase the power and functionality of the plugin, but that means you'll have to pay more money. After a second look at the plugin, I understand the reason for it being called #1. The price is great for what you get out of it, and those add-ons are incredible! (You should really check those out too!) From a personal stand point, I now look at it and see how great this plugin would be to build some engaging Landing Pages, so I may just buy this thing for business use. So who wins our drag and drop shootout? Well... it's hard to say. When compared side by side, Divi seems the obvious winner over the Themify Builder. For only twenty dollars more, you get a theme with drag and drop capabilities that can become anything you want it to be. However, the simplicity of the Themify Builder will likely appeal to some users. Now, when you look at price and features, I feel that Visual Composer's latest update with the front-end editor means that it beats out the Themify Builder as well. Half the price, but twice the functionality. The hardest comparision, though, would probably be Divi versus VC... The reason? Divi is a theme, while Visual Composer is a plugin. I think Divi definitely wins the top spot as the best all-in-one package. Buying Divi eliminates the need to buy another theme, however, if you already have a theme you like but what to add drag and drop capabilities to it, then Visual Composer is perfect for the job. VC has the better price (under $30), and you can use it on all WordPress themes (this would make it nice for designers who develop multiple sites); the add-ons to Visual Composer also lend as a selling point. My only concern with all the add-ons for VC would be site speed. Divi isn't the fastest loading theme around, but using Visual Composer along with multiple add-ons on any theme – even a fast one like the Genesis Framework – could be similarly affected due to all the scripts that would need to run to create a dynamic type of site. Although, you may be able to side step to that by using a CDN (Content Delivery Network). I've come to believe that there is no so such thing as a "best" drag and drop interface on the market, because what's best for you will depend on what you need. These three products are a great place to start your search. Have you guys used any other drag and drop system that you really like? Is there anything about these three that you think I missed? Be sure to comment below. I'd love to hear your input! Ariel is a WordPress Web Designer specializing in the Genesis Framework, and is also a freelance writer for hire. When she's not writing or designing websites for her clients, she is helping others learn how to make money online. I have made my website using divi theme but getting one problem, when i set featured image for then post it shows me inside the post which i don't want to be shown inside the post if you can help me please help me. I like DIvi WordPress themes because they are modern and suited for mobile traffic withiut the need of a plugin to make the website mobile. Thanks for this article. I find it because i was searching info about Themify's page Builder (not bad). Recently i found a builder made from ThriveTheme. Have you heard about it ? I think this is a great list of drag and drop builders. I would like to add a suggestion for "Beaver Builder" their front end drag and drop builder is amazing! I use it on all of our client projects. Cheers! I already use Visual Composer quite a bit and like it. Thanks for putting together this informative page. I will check out the other 2 as well as you recommended. I already used Visual Composer to create my own website about two year ago. I can say that works very fine if you know what to you want to obtain from your page, even if you have minimal knowledge of html. There are other plugins like: Page Builder by Siteorigin and Live Composer. Although, the themify and visual composer are the ones that I would like to use. BUT, I cannot figure out which one will be the best to keep on working on the site: http://www.tourismo.CO/ - all of them look nice but we want to invest our time and money on the best. Ariel, Thank you for the great comparison. Thanks for the comprehensive comparisons! Our company is working on building a new extranet, and I've been trying to decide which to use: Divi or a different theme coupled with Visual Composer. It sounds like Divi is the best choice for us, based on your comparisons (and the fact that I've been an Elegant Themes subscriber in the past and was impressed with their quality and support). I use the edmin and the Fullscreen themes for a couple of websites and they both work very well. Nice post Ariel. I love their Elemin and Parallax single page themes but some how I feel uncomfortable with their drag and drop plugin, may be training issue. M Always like Ariel's Posts & their works..